Some people believe magnets have therapeutic effects and can be used for pain-relief. 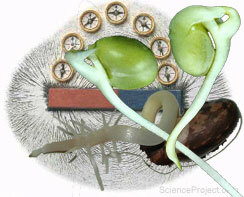 Some also believe that magnets can affect seeds and plants. Many studies have been performed on plants and some researches have suggested that plants have feelings, can think, and can recognize people. Many of such suggestions are controversial and are not widely accepted by scientific community. The effect of strong magnetic fields on seed germination and plant growth is one of the suggestions that can easily be studied by students as a science project. In this project you will perform experiments to determine if magnetizing seeds before planting can affect the germination rate and plant growth. This project requires growing seeds that take 3 to 4 weeks. More details or support on this project is available for the members of ScienceProject.com. Materials needed for experiment such as super-magnets and petri-dishes are available at MiniScience.com.